The world of Lennus is a world of legends and wonders and is divided into two continents; Naskuot, the northern continent and Saskuot, the southern continent. Thirteen years ago a strange disaster befell this world and killed many people. Upon the ruins of a great city and sealing back a great evil, a school of magic was built. Young Chezni is a student of that school of magic, striving to become a great spiritualist and control the elements. Meanwhile, a dictator to the south, Zaygos has conquered the entire continent and seeks to conquer the other half of the world. One day, after class Chezni is dared by a fellow classmate to enter and explore the forbidden tower that sits outside the school of magic. Entering the tower, Chezni will soon learn of the machine, Dal Gren that has been sleeping there for 10,000 years. What consequences will his actions have? 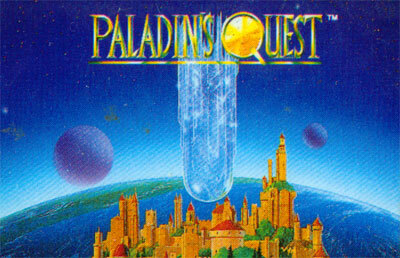 Paladin's Quest is a 1-player RPG where the player moves around the world and in locations using an overhead view with up to four members in the party. Randomly encountered monsters engage in a first-person view battle mode that is played using turn-based commands to each player. Along with weapons, magic is available and uses the character's own hitpoints to command. There is no healing magic and no healing items, rather some characters have "bottles", one type of which can restore HP and these can be filled (nine uses per bottle) at most towns. Each character has a different profieciency in one of eight different elements, which may be combined to produce additional spells. New element usage can sometimes be learned by main characters in temples.